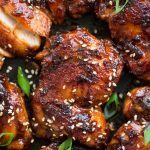 Sticky Korean Chicken made with Gochujang, soy sauce based marinade is bold in flavours and really easy to make. Chicken thighs coated in a sweet and spicy sauce and cooked until juicy. 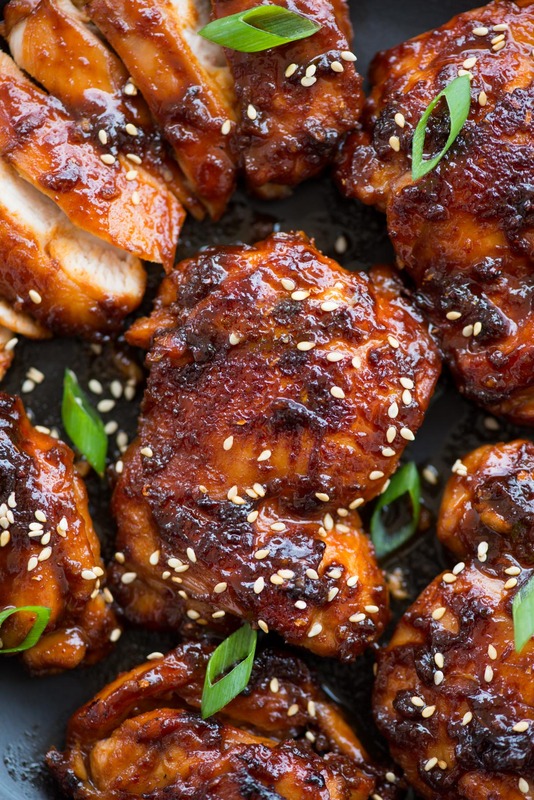 These delicious Sticky Korean Chicken Thighs has amazing sauce and is so so juicy. With just a handful of ingredients, you can’t go wrong with this Korean Chicken recipe. The sauce is sweet and savoury. The Korean Chili paste aka Gochujang gives that Umaminess to the sauce. Isn’t it nice to have quick and fuss-free recipes on your back pocket for those busy days? It is even better if you are bringing dinner to the table in less than 20 minutes. This Korean Chicken thigh recipe just fits all the bill. The caramelized sauce that coats the chicken is to die for. Back to back two Korean Recipes guys. 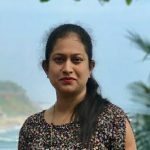 I am totally obsessed with the flavours and can’t help sharing all the new recipes I am trying. This marinade is really easy. Just throw in the all the ingredient, mix well and add chicken thighs. Unlike other Chicken recipes, you don’t have to rest the marinated chicken. 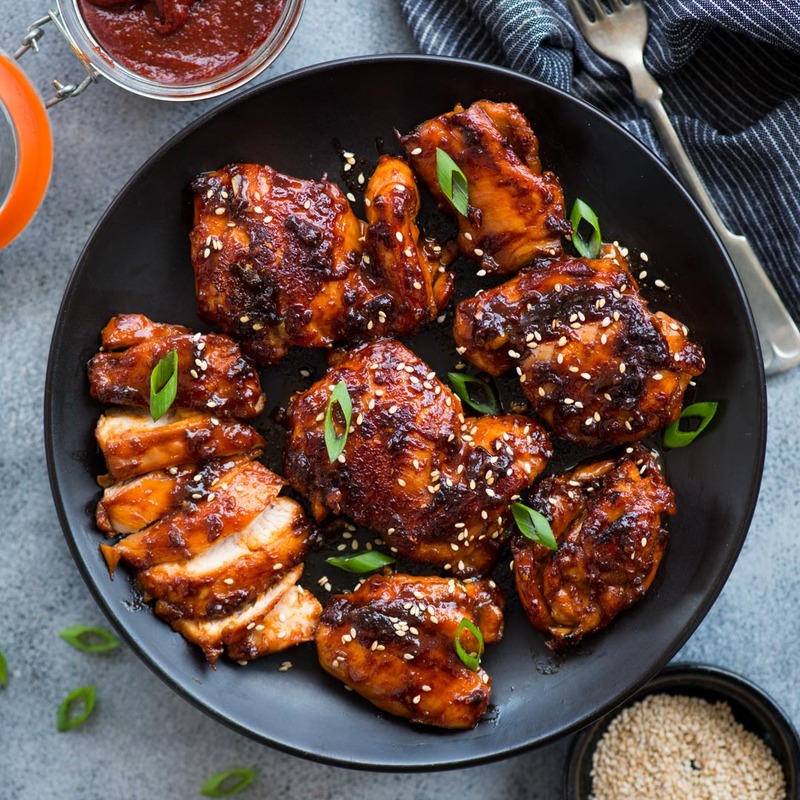 Gochujang is an important ingredient in this marinade. 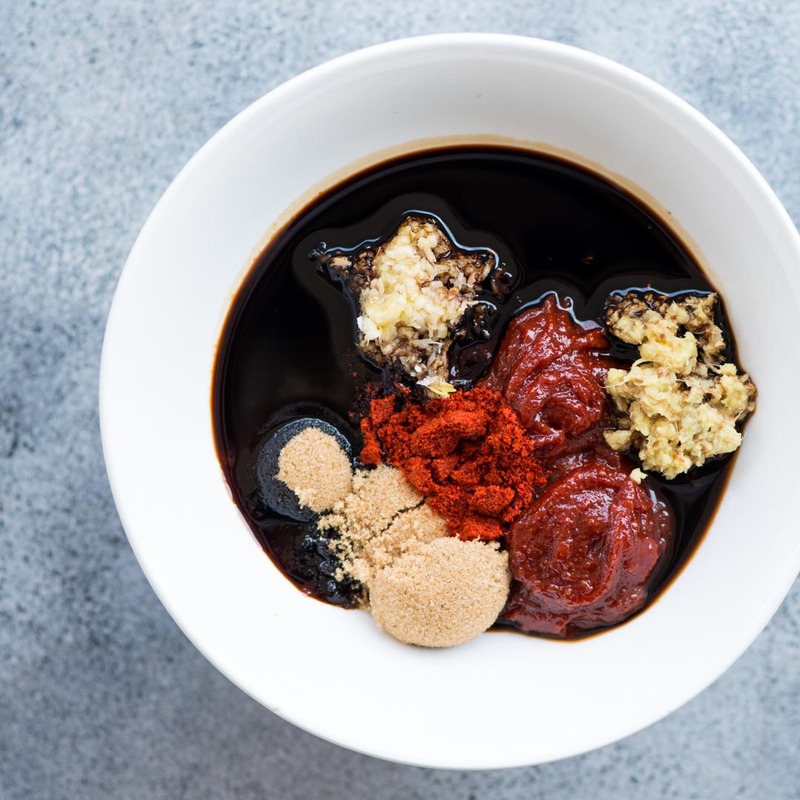 Gochujang is fermented red chilli and bean paste. It is a staple in Korean cuisine. The flavour is really intense and a little goes a long way. Gochujang is easily available in the Asian section of the grocery store. The pungent flavour of Gochujang is balanced by soy sauce, Brown Sugar, Garlic and ginger. I have added paprika for little extra spicy sauce but you can skip if you prefer the sauce to be less spicy. The best way to get juicy chicken is to use Chicken thigh. Chicken thigh remains juicy no matter how you cook it. As we are not marinating the chicken for too long, chicken thigh is the best choice. You can certainly use Chicken breast instead. If using chicken thigh make sure you cook it for the right time to get juicy chicken. To get the right balance in the sauce, check the seasoning before adding it to the chicken. Add more soy or sugar to bring the balance. Substitute sugar with honey for a healthier version. To get perfect caramelization, use a heavy bottom cast iron pan. 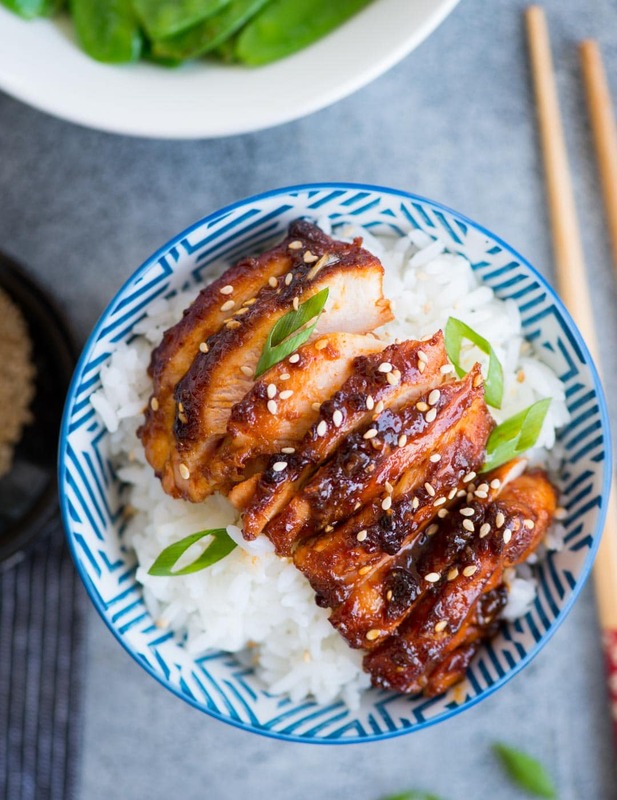 Serve this Sticky Korean Chicken with rice, sprinkle sesame and lots of green onion. Mix all the ingredients mentioned under Marination. Add chicken to the marinade and toss it well to coat chicken well with the marinade. Heat a heavy bottom cast Iron Skillet. Add oil. Shake off excess marinade and arrange Chicken in a single layer leaving space in between. Cook undisturbed for 4-5 minutes on medium-high heat. Flip chicken and cook the other side for another 3-4 minutes. Serve with rice. Sprinkle sesame seeds and green onion on top. While adding chicken to the pan, don't crowd the pan. Add chicken in two batches for crispy caramelized skin.